I brought four-five eggs day before yesterday and today when I cracked one I saw blood in it, rest others were fine. It doesn't look like a drop of blood fall upon it, it looks like I can't separate it like someone pierced yellow part and blood burst out of it. Question: What is it, chicken and I killed it? Is it safe to eat it, scrambled egg? I regularly see these (although, not usually as big), and they are considered safe to cook and eat as usual. they are safe to eat. We don't see them (or don't see very large ones) regularly because they are normally detected by candling, and such eggs are removed (this is why blood spots are more common in eggs from local farms that might not be using such mass-production techniques). Many other sites say things along the same lines, including the USDA. However, notice the other USDA comments on egg freshness and safety. Definitely make sure the eggs are cooked thoroughly (as always! ), especially if they're from local farms and may have not gone through pasteurisation or other post-collection disinfection methods. 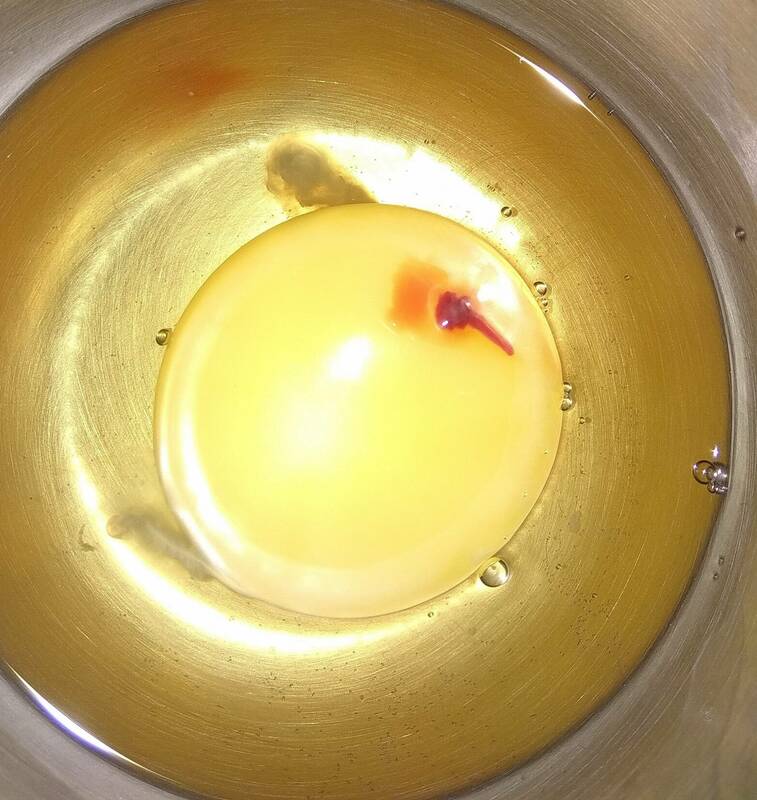 @BaffledCook might be right on the freshness comment (independent of the blood spot), although the photo you took is very bright and makes it a bit hard for me to tell how clear the egg white is or whether the yolk just broke when you cracked the egg. The "err on the safe side" is usually a good rule to follow if you're concerned (it's just an egg!). I'd say it is not a fresh egg because there's very little yolk there. In this case, it's would be better to err on the safe side and ditch the egg. About killing the fetus: you didn't kill it as you didn't take it out of the incubator/from under the chicken. It was already dead when you bought it. What does the egg white do in peppermint creams?